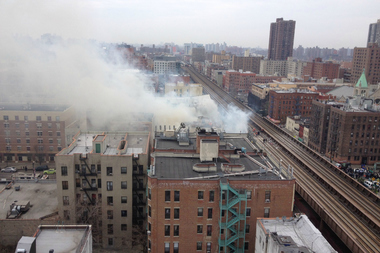 An explosion on Park Avenue near East 116th Street sent up plumes of smoke visible from surrounding buildings on March 12, 2014. EAST HARLEM — After federal investigators split the blame for the deadly East Harlem gas explosion, hundreds of lawsuits seeking millions will start moving forward. Findings from the independent report released Tuesday by the NTSB pointed the finger at both the city and Con Edison for the March 2014 blast that killed eight people, leveled two buildings and ruined several business in the area. "It adds credibility to all of the negligence claims," Robert Vilensky, a lawyer for several victims, said. The NTSB report said a faulty gas pipe maintained by the utility company and erosion under the pipe, which the city ignored for nearly a decade, allowed gas to fill the buildings. The Comptroller’s Office has received 299 notices of claim regarding the March 2014 explosion, nearly 100 more since DNAinfo first reported the pending lawsuits in December. Many of them also name Con Edison. Many of the notices of claim have already resulted in lawsuits against the city and Con Edison. Last week, Con Edison, filed their own lawsuit against the city, records show. What will most likely happen next is that, as more and more lawsuits are filed, the city and Con Edison will ask a judge to consolidate them, Vilensky said. That way instead of having to undergo hundreds of depositions and answer to dozens of judges, the city and utility company will do a handful of depositions and work with one judge, added. As far as the timing, that largely depends on whether the city and Con Edison contest the negligence claims or settle. Con Edison intends to address the lawsuits through the court process, a spokesman said Thursday. The city did not reply to questions about their legal strategy. Previous statements suggest they plan to contest the claims. Similarly, Con Edison contested the report's findings and pointed the finger at the city. “To be clear, not all of the participants involved in this investigation reached the same conclusion concerning the sequence of infrastructure failures that led to the explosion,” Con Ed said in a statement. They also released a “Sequence of Events” video that argues that the sewer lining is mainly responsible for the blast. With neither side accepting responsibility, the victims of the explosion will probably wait years before seeing any resolution to their pending legal battle, Vilensky said. “You are going to have 300 lawsuits clogging up the system alleging negligence and costing the tax payers more money,” he said.